"There is growing concern among aid groups on the ground of potential disease outbreaks," the International Federation of the Red Cross and Red Crescent Societies (IFRC) said. "Already, some cholera cases have been reported in Beira along with an increasing number of malaria infections among people trapped by the flooding," it said in a statement. "Hundreds of thousands of children need immediate help," she said, estimating 1.7 million people were affected by the storm. "The help is coming, but it’s coming very slowly," said Esther Zinge, 60, from near the town of Buzi, adding that what did arrive had to be given to children first. United Nations Secretary-General Antonio Guterres said he was saddened by the "heart-wrenching images of human suffering" and urged the world to step up support for the relief effort. 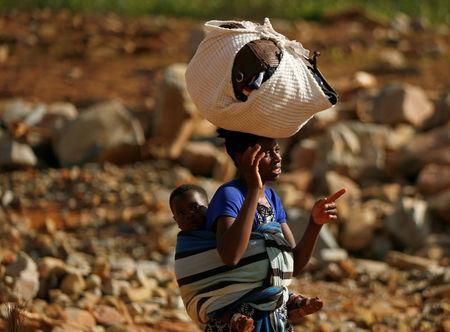 In Zimbabwe's Coppa Rusitu Valley, a township in Chimanimani near the Mozambican border, hundreds of homes were flattened by large rocks and mudslide from a nearby mountain, burying some residents, who never stood a chance as the cyclone unleashed its fury at night when most were sleeping. "There have been three security incidents today, all food related," he told his team, without giving further details. "These are desperate people," Laerke said. "I don't think anybody would blame a desperate mother or father who have children who do not have clean water to drink or food to eat who grab it from wherever they find it in a shop." The storm's rains caused the Buzi and Pungwe rivers, whose mouths are in the Beira area, to burst their banks.